According to EveryTown Research, since 2013 there have been more than 300 school shootings in the US — an average of about one per week. A recent article published by Campus Safety Magazine states that nearly all US schools now have planned responses in the event of a school shooting. In 2016, the US Department of Education found nearly 90 percent of public schools had a written plan for responding to school shootings and 70 percent of those schools had drilled students on the plan. This is for good reason: shootings are among the deadliest types of emergencies a school could face. One of the best ways to mitigate this risk is to deploy policies, procedures and technologies that keep unauthorized visitors from gaining access to a campus in the first place. 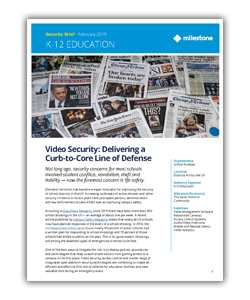 In this security brief “Video Security: Delivering a Curb-to-Core Line of Defense” you’ll learn how video security, access control and a wide range of integrated open platform security technologies are combining to create an efficient and effective first line of defense for education facilities and save valuable time during an emergency event.